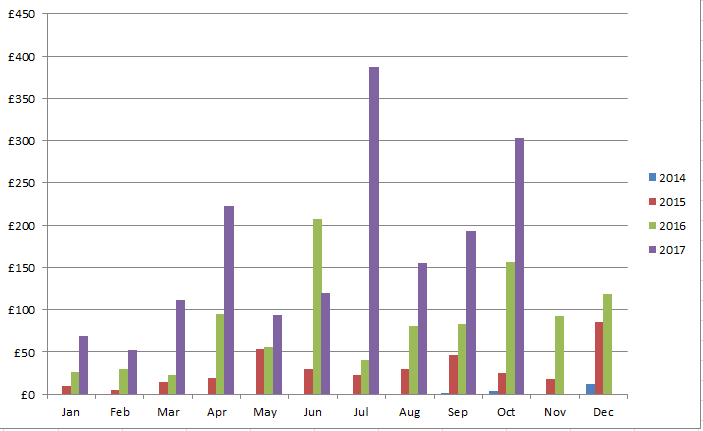 A great month of dividends totalling £303.18, the second highest received this year! Whilst September was a very good month for MB, October was a bit of a disaster. My winning streak on the no lay accumulators (accas) turned into a losing streak and at one point, I found myself staring at an overall MB loss of around -£400! I was tempted to call it a day on those accas but doggedly persevered and managed to string some wins together over the weekend. Those, along with my usual MB (other football and horse racing offers) meant that I made a profit in the end of £90.53. I’d normally be disappointed with such low profit but on this occasion, I was just relieved to make any profit! Total profit made for the year now stands at £4,410. For those interested in stats, last month, I did 36 no lays, which resulted in a 44% win rate, 25% loss rate (16 wins, 9 losses, 11 acca insurance) leading to an acca profit of around £650. This month, I did 60 no lays, which resulted in a 13% win rate, 47% loss rate (8 wins, 28 losses, 24 acca insurance) resulting in an acca loss of around £150. Did it take a lot of time to do those 60 no lays? Not really, I just did an occasional half-hour of MB in the evening and perhaps a total of around 3 hours across Saturday and Sunday. The no lay acca strategy is a long-term (and slightly risky) one but despite the bad run, I’m going to continue to do them for now. However, I think I will be more careful about duplicate legs across different accas (I’ve been sloppy and this is a killer when the team loses and affects several accas). I will also avoid including the team I support (Liverpool) in ANY of my no lay accas – there’s just too much pressure to win and the team still can’t defend for toffee! Anyone else do no lay accas and if so, how are you getting on with them? Note that there are plenty of folk who do MB who don’t touch accas at all but who still make regular profits from other offers. The matched betting guide I subscribe to is OddsMonkey*. It’s a nifty little website for beginners and experienced matched bettors alike – for beginners, there are plenty of tutorials which provide you with step-by-step guides on how to make profits and to work through special offers. They also offer one-to-one sessions for those who need a little more help. OddsMonkey offers quality tools including the Each Way Matcher, Extra Place Matcher, Dutch Finder, Racing Matcher and Acca Matcher. There’s also a friendly forum for you to ask questions. Anyway, check out the free trial*. Phew – bit of a long update this one, time for a cuppa tea methinks! This entry was posted in Books, Cashback, charity, Dividend Investing, Earnings, Expenses, Funds, Investment Trusts, matched betting, Portfolio, Savings, Shares by weenie. Bookmark the permalink. Well you’ve gone one step better (further?) than me in no-lay accas. I came accross the first downturn as you have an bailed. I do think that clearly maths is on your side for the long run, but given there are so many ways to make money from MB I’ve decided I cant handle that risk. I got tipped over the edge by a 12 acca losing streak, and pulled out with minimal profit remaining. I’m also a liverpool fan laughed when I read that… nice jab at the blues with the toffee stick 😉 could be a worse season could be un-raveling like theirs! One question. How do you know what your dividends are on your Vanguard Funds? I’ve got some funds through Cavendish (Fidelity and L&G Worlds) but don’t get any visibility of the dividends which is a bit naf, would prefer to see it as it’s help motivate! They are auto re-invested so maybe thats why? Or is simply that my Platform provider doesn’t give the info yours does? That chart with the dividend year on year comparisons is great to look at! Although I’m still running with them, it is hard to stomach the variance from the no lay accas, although whilst I’m sitting on an overall decent profit, it’s probably easier to do. Not so sure how I will feel when I reset my profits to zero at the start of 2018! Haha, I wondered if anyone would notice the little ‘toffee’ jab – decent win for us against the Hammers this weekend but again no clean sheet! I’m receiving dividends as income from my Vanguard ETFs so they get paid into my investing account. Monevator did a good explanation of how to work out auto reinvested dividends for funds here: http://monevator.com/accumulation-funds-dividends/ The post is from a year ago, so hopefully still valid. Congrats on a still very positive savings rate – it may not be as high as you would like but still way above the national average! Throwing over £1k into your ISA means you will have a really nice fund building in your future fund very quickly! Fingers crossed the kitchen moves along soon, not only for the christmas but so you can get the homebrew up and going again! 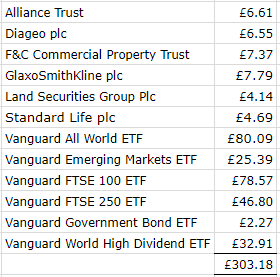 Superb result on the dividends – got to love the simplicity of those ETFs… buy, forget and suddenly find extra cash in your account – what is not to like?! And you can’t really grumble at being able to tick off 50% of your goals with still 2 months to go – great stuff! Yes, just continuing to chuck money in regularly will reap the benefits. I’m not sure that I will be able to max out my ISA this year (maybe max out at last year’s limit though!) but I’ll just put in as much as I can. Yes, tell me about it – the kitchen is delaying my homebrewing activities. I’m resigned to the fact that I may not be able to get back into it til the new year. Just as well that Tesco have a current BrewDog offer on – a 4-pack is normally £6 but they’re doing 2 x 4-packs for £9 so I’ve been stocking up (Punk IPA and Dead Pony Club). Thanks for the tip weenie, I’m off to Tesco this afternoon now. As for the investments in Brewdog, I’m very interested, mainly because I like the product and ethos. However, I’m struggling to see where the return will come from or even how you would get your money back. Is it a private ltd company? In which case you could get you money back if it went public? Haha, I picked up a couple more 4-packs myself this evening! As regards to investing in BrewDog, I think the main thing is to not invest if you are looking for a return! There’s always the possibility of a dividend being paid in the future (although no plans at present) and of course, perhaps it would go public in the future. As an investor, you get 5% discount off BD bars (10% online discount). If you invest over a certain amount, you get free bottles of exclusive brews too, so I guess that’s a ‘return’ of sorts. Best to read the prospectus or to ask questions direct. I did check out the prospectus, just wondering if I was missing something. I ended up picking up a 12 pack for £13, slightly cheaper per can. I’m always looking out for good beer on offer but rarely go to Tesco, so thanks again for the tip. Hopefully the wait will be worth it and you will have a fabulous kitchen ready for you in the new year! Guess I missed your last post on Brewdog. But I just couldn’t withstand the idea of being part of their team as well. So we are partners as of today. In general, your blog kind of made me open up my eyes to see not all must be straight forward main stream stocks or ETFs; you can have some fun, while getting rich…. Great stuff! Although I don’t think I’ll be making money out of BullDog, I’m quite excited about being a shareholder and being a part of their growth/expansion plans! Thanks for the great feedback – personally, whilst my main plan is to continue to invest in boring index funds/ETFs, l just think that we should have a little fun along the way just to make things interesting, which helps with motivation too! You look very on track to hit, if not all, most of your goals this year. And if you don’t hit them all, that’s still a very impressive savings rate, definitely giving yourself a great chance in your next milestone race! With my kitchen hopefully hanging on in there until we get a new one fitted early next year – cupboard door fell off this weekend, the latest casualty in our kitchen….I have sympathy too with your kitchen work, fingers crossed it’s not much longer! Thanks Sarah. The savings rate is good but I continue to strive towards that elusive 50% which would get me to the next milestone that much quicker! That kitchen must be so frustrating. Can you use it at all? So good to have reached some of your goals already. Take the time, read 3 more books, and the table will be a sea of green. An SR of >40% is definitely a winner, even if it didn’t quite meet your goal. Thanks for the email info too – I will take some time over Christmas when I’m off work to learn more. Yes, I’m confident of hitting my reading goals so it’ll just be the savings rate one I’ll struggle with but like you say, >40% is still a winner. No worries, hope you can find more info on Matched Betting. Interesting stats regarding your accas. Over the 2 months you have probably done pretty close to expected assuming the acca odds were around 3.5-4.5 on average. Regarding no-lay accas, having one match in several accas can be a killer if it goes down. I use no-laysas well and it does pay to spread the accas across as many games as possible while avoiding reducing the EV drastically. What I have done, if one match is the last leg in a set of winning accas, is to put an insurance bet on against the team in question. Spurs v Crystal Palace was the last leg of around £150 worth of accas this weekend and I laid Spurs for £20 which would have netted a consolation of around £75 (or something) if Spurs hadn’t won. Fortunately they squeezed out a win and helped make it a good weekend overall. Yes, I figured that some months will be good, others not so good but in the long run, it should be good overall. Hard to take the losses though! This month is likely to be a loss as I’ve only been able to do one weekend of no-lays and it’s not really worth doing them for friendly international matches where results are a lot more unpredictable. Thanks for the tip on laying the last leg of a winning acca, never thought of doing that before but I’ll definitely consider it in future, which should help buffer some of those losses! If you like the Brewdog Punk IPA, I can recommend the Youngs American IPA (homebrew). Makes a lovely strong, hoppy ale which works out a lot cheaper than the Brewdog and although hard to believe actually tastes better IMHO. Thanks for stopping by! I’ve brewed Youngs APA (American Pale Ale) but not the IPA so I will try that at some point – thanks for the tip! Thanks Jamie and yes, making some good process. The graph is a great motivator! You’re doing better than me on the no-lay accas. I’ve placed 40 with 4 winners, 12 refunds and 24 losers. Painful! Ouch, that is painful! As mentioned above, this month isn’t going to be great, only because I’ve only done a few this month which have lost and I won’t have time to try to bag some winners before the end of the month. Good luck with your future no-lays! Hi Weenie, I like your website! (One of the investment people I follow on twitter posted a link to it – sorry I can’t remember who.) I think you’re doing great (you’re saving regularly and you’re buying sensible investments – I’m particularly a fan of investment trusts – and you’re reinvesting dividends). If you carry on like this, you’ll be able to retire fairly soon. Have you done some calculations? Eg £129K now, adding £16K a year for 10 years at average annual return of 7% is approx £490K. Then you could take say 4% of that as income? = approx £19K a year (worth about £15K in today’s money assuming inflation at 2.5%)? How does that sound? Regards, Chris. Thanks for stopping by. Whilst the income I’m ultimately seeking will be around £19k-£20k, I’m not going by a SWR of say 4% as I don’t intend to preserve the entire capital – I will end up selling some of the capital for income. My plan is to have my investment trusts throw off enough dividends so I won’t have to sell off so much. It’s not my intention to spend all of my pot, but I will likely spend most of it and hope I can enjoy myself at the same time! Hi Weenie, thanks for your reply. Regarding selling some of the capital: yes, I did some rough calculations earlier this year. 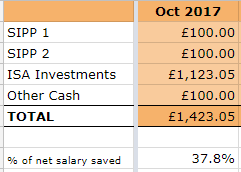 Eg if I start by taking 6.5% of my savings, inflation linked each year at 3%, and assuming average total return of 7% a year, I run out of money in approx 24 years. Regarding luck: in a way you don’t need luck. If markets do well you could retire a little earlier, if markets do less well you could retire a little later. But you’re still retired and financially independent in the not very distant future. Regards, Chris. Agree, I could retire a little later if the markets aren’t doing so well. However, I’m thinking what if the market really tanks, ie like another financial crisis which will take 10 years to recover!? I guess this means I will need to have a bigger cash buffer but I’ll concentrate on the investments first I think. Hi Weenie, I think you’re in a fortunate position because you’re still adding significant sums of new money. A market fall isn’t all bad news – because your new money then buys more shares. I did a quick calculation. I changed the example I gave earlier. If we assume a recession for three years (-5% each year), then a return to growth for seven years (+11%) then (in the example I gave) you’d have £493K, which is slightly better than the £490K from +7% for ten years. (Of course a financial crisis like the one of 2007-2009 would be much worse than -5% for three years – but then the bounce back from the crisis is likely to be very strong.) Regards, Chris. No lay accas look like being a bit of a roller coaster! I finally started them this month and kicked off with a few winners so hopefully can keep my head above water from the offset but we’ll see eh. I really like it so far, the maths is in your favour so you know if you keep churning them out then the profits will add up. Also they are very quick to do, you can pump out 5 in about 10 mins and the EV of each is about £5 so that is £25(EV) for just 10 minutes work. Sounds pretty good to me!!! I need to check if my PP accounts will pay out on the offer as I’ve been heavily restricted so just gone in with a fiver at first, but will start going max bet (about £20 haha) if/when I can as you can claim 4 per day with them I believe which is pretty crazy. I can see though that the more and more you start to do, it will be harder to stop that one team bringing down all of your accas!!! My accas are all going down the pan tonight it seems… beginners luck also definitely a “thing”!!! 1 postponed (voided) and Moscow’s draw has killed off all my accas before they even got started! Disaster. I’ve done 54 AP £10 accas so far and am at -£230 for the lot. Yea pretty much same as but fortunately didn’t do as many as that as I’m only just testing the waters right now. It seems postponed/cancelled games could be something to watch out for… especially in the lower league games over winter up in Scotland etc…!!! I had two cancelled matches one in Germany and the Scottish one.